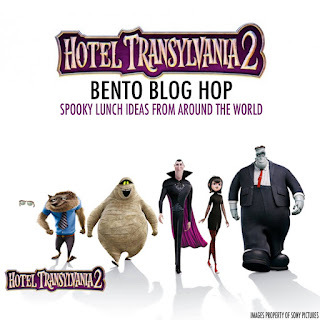 BentoLunch.net - What's for lunch at our house: Hotel Transylvania 2 Easy Bento Ideas! Hotel Transylvania 2 Easy Bento Ideas! Are your kids excited for Hotel Transylvania 2? Mine definitely are and we're hoping to get out and see it this weekend or next. Who doesn't love Dracula, Murray, Frank, Wayne, and Griffin? And this time, there's even a Grandpa Dracula (Vlad)! I really think this is going to be an awesome Halloween movie. First up, we made a Count Dracula, or Vlad, bagel-wich! The kids love toasted bagels with cream cheese for lunch. Dracula is a blueberry bagel with mixed berry cream cheese. To turn our bagel into a vampire, we added a set of vampire teeth into the hole part of the bagel and a couple of eye picks to make the face. If you don't have eye picks, candy eyes or even M&Ms will do in a pinch. Our vampire teeth came in a 20-pack, so we'll be playing with those all month long. Our second easy idea is for a Murray the Mummy sandwich. Once again, we didn't use fancy tools. We made our ham sandwich on honey wheat and used a large circle cutter to make it round. I cut a piece of havarti with the same cutter, then used a knife to make strips for the bandages. They don't have to be straight cuts, I actually think they look better a bit uneven. I removed one strip near where I wanted the eyes, then cut a strip of purple Fruit by the Foot to replace it. I added candy eyes on the purple part and cut one more small bit for a mouth. Now our ideas are pretty simple today, but we're joining in with several of my fellow bento bloggers, so you'll find lots of great ways to make movie-themed lunches. Just click on the button below to take you to the next blog in the loop! Have fun, happy haunting! Cute! I'm going to have to make the vampire bagel this year. Love both ideas, so very cool!